Our Charity Movie is back! 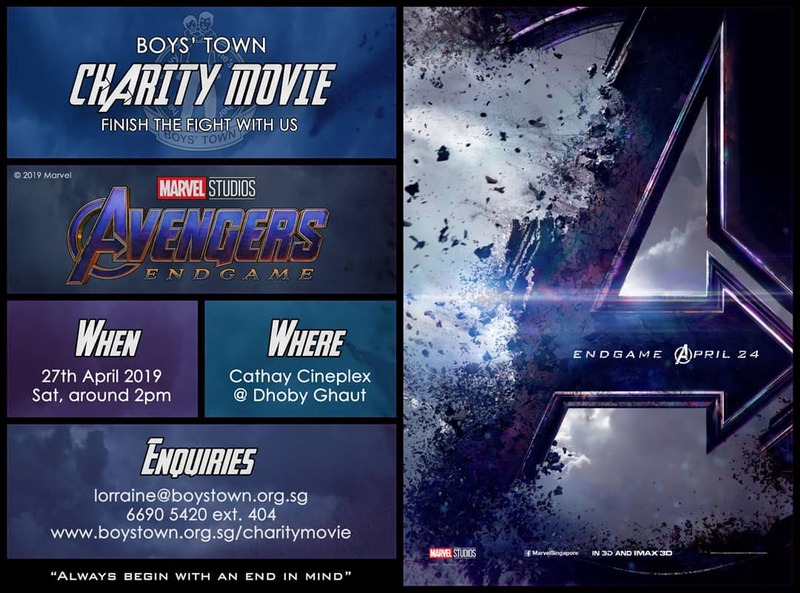 Join us for Marvel Studios’ Avengers: Endgame on Saturday, 27 April 2019 (estimated 2pm) at The Cathay Cineplex (near Dhoby Ghaut MRT). Always begin with an end in mind – finish the fight with us! Individual donation: For every $50 donation, you will receive one movie ticket and popcorn combo set as our token of appreciation. Donations are entitled to 250% tax deduction (if applicable). Your support gives us the strength to carry on, and most importantly, gives hope to those we serve. We hope you can join us for the show! Donations made by 19 April 2019 will be entitled to the token of appreciation, subject to availability.